There are two types of data compression in SQL Server. ROW Compression. This compression feature takes into account the variable data type structures defining a column. Take, for instance, a CHAR(100) column stored in a variable length storage format will only use up the amount of storage defined by the data. Storing “SQL Server 2008 ” in the column will only require storing fifteen characters instead of the full 100 characters, thereby, a 85% savings on storage space. This is the extension of the vardecimal storage format made available in SQL Server 2005 Service Pack 2. Note, also, that this compression feature does not take any disk space for zero or null values. PAGE Compression. This compression feature is a superset of ROW compression and takes into account the redundant data in one or more rows on a given page. It also uses prefix and dictionary compression. What this simply means is that for both page compression techniques, the storage engine cuts down on repeated data in the page. For example, if a table is partitioned using a column prefix, all data in a specific partition will have the same or similar prefix. Let’s say the value of columns start with something like A1000Q-xxxx like some product codes, the storage engine store the A1000Q- once on the page and then refer to this value from all other occurrences of this value on the same page. This can also be said of a column with a defined DEFAULT constraint. Page compression only occurs when the page is full to optimize the performance. This will launch the Data Compression Wizard. 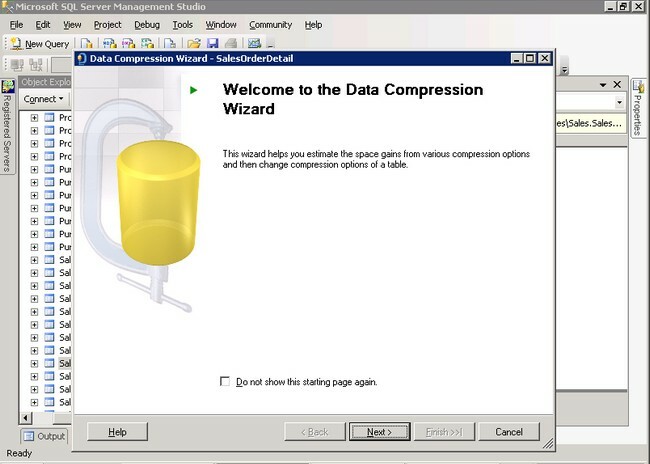 On the Welcome to Data Compression Wizard, click Next. On the Select Compression Type page, click the drop-down menu on the Compression Type column to select your compression of choice. Click the Calculate button to display a similar information provided by the table/stored procedure. 3.PAGE compression feature is a superset of ROW compression. Page compression only occurs when the page is full to optimize the performance. Push Subscription With a push subscription, the Publisher propagates changes to a Subscriber without a request from the Subscriber. Changes can be pushed to Subscribers on demand, continuously, or on a scheduled basis. The Distribution Agent or Merge Agent runs at the Distributor. Data will typically be synchronized continuously or on a frequently recurring schedule. Publications require near real-time movement of data. The higher processor overhead at the Distributor does not affect performance. Most often used with snapshot and transcriptional replication. Pull Subscription With a pull subscription, the Subscriber requests changes made at the Publisher. Pull subscriptions allow the user at the Subscriber to determine when the data changes are synchronized. The Distribution Agent or the Merge Agent runs at the Subscriber. Data will typically be synchronized on demand or on a schedule rather than continuously. The publication has a large number of Subscribers, and/or it would be too resource-intensive to run all the agents at the Distributor. Subscribers are autonomous, disconnected, and/or mobile. Subscribers will determine when they will connect and synchronize changes. Most often used with merge replication. How to check port 5022 is blocked on a Windows machine? Run below command in command prompt to verify whether port 5022 is blocked or not. The best way to check if a port is blocked is to do a port scan from the client machine. Using a PortScan utility you will get one of 3 results. SQL Failover Clustered Instance Installation Step-by-step process explained in the below attached ‘StarWind-SQL-Cluster’ document(with screenshots) and Video. What good is a backup if you do not know to restore the backup. In this tutorial we will look at what restore options are available and which options are only accessible using T-SQL commands. As you will see there are many options that can be used, but just like the BACKUP commands there are just a few parts of the RESTORE command that are needed to do a successful restore. Take the time to review each of these topics to get a good understanding of what is available. You can either use the outline on the left or click on the arrows to the right or below to scroll through each of these topics. There are several RESTORE commands and options that can be used to restore and view the contents of your backup files. 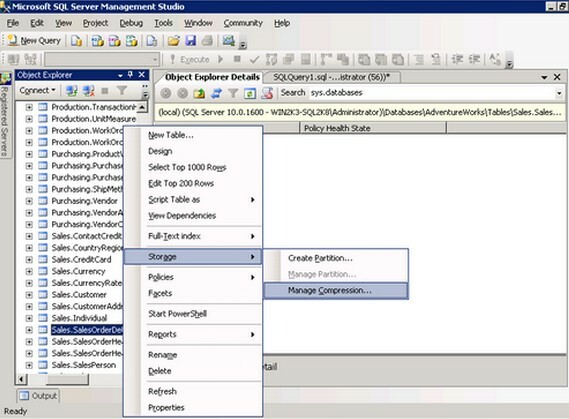 Take the time to get to understand what options are available and what can be done using SQL Server Management Studio and what options are only available via T-SQL commands. One of your last lines of defense for just about any system is to have a backup in place in case there is a need to recover some or all of your data. This is also true for SQL Server. If you are new to SQL Server you should review each of these topics, so you are aware of the available options and what steps you will need to take in order to recover your data if ever there is the need. In SQL Server 2005, if you connect to a database that is being mirrored with ADO.NET or the native SQL Server client, your application can take advantage of the drivers’ ability to automatically redirect connections when a database mirroring failover occurs. In order to do this you must specify the initial principal server and database in the connection string and optionally the failover partner server. From a database mirroring and ADO.NET perspective, the failover partner in the connection string is used as an alternate SQL Server if the initial connection to the principal SQL Server fails. If the initial connection to the principal SQL Server succeeds, then the failover SQL Server parameter will not be used. If not, then the failover partner should accept the connection and your users should be able to use the application as expected. Many applications use of multiple databases on a single server. Or one application may reference multiple databases. However, database mirroring works with a single database at a time. As such, you need to take this into account when designing mirroring into your database architecture. Most of the applications are being built where multiple databases make up the application, so if only one of the databases fails over in mirroring the other database will still be functional on the principal server, but the application won’t work. How can I be notified when this happens and make all of the databases fail-over? Note: In such situation,for all the application dependent databases, we used to configure database mirroring separately for each database. But again if there is an database specific issue (ex: DB corrupt), fail-over happens to that database only but not for all databases, ultimately application wont work. “One of the big issues with Database Mirroring is that the fail-over is tied to one database” , to over come this we can use Always ON Availability Groups (AG) where we can group multiple databases into one unit and can perform fail-over.